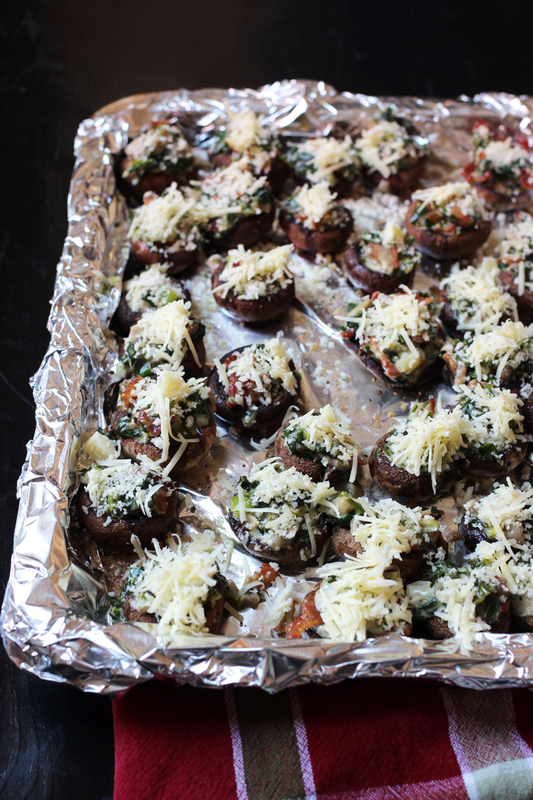 Enjoy a flavorful appetizer with this easy stuffed mushrooms recipe. 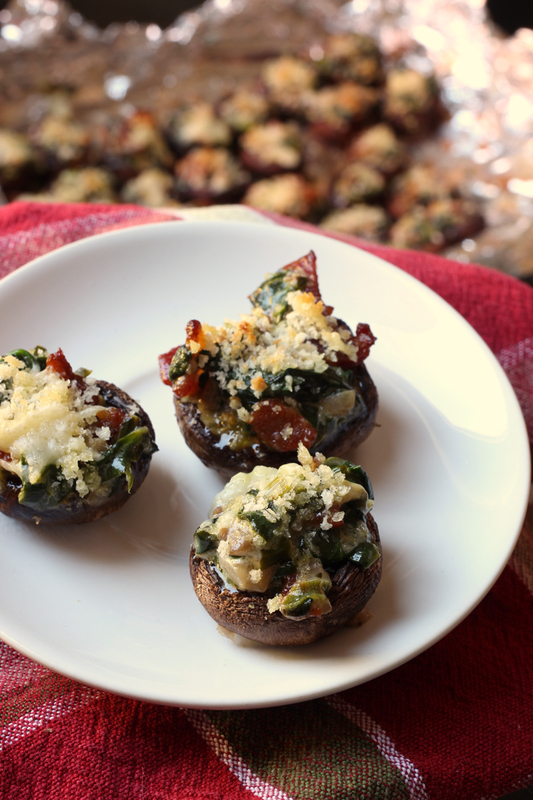 Bacon, greens, and cheese make the humble mushroom amazing! I did not grow up eating “greens.” My parents are from the Mid-West. Iceberg lettuce was as green as things got. Due to the aforementioned heritage, I never ate “greens” on New Year’s. Luck or no luck, that particular dish never crossed my path. Once upon a time, almost ten years go, my eldest son developed an interest in wild edible foliage. For reals. He read umpteen books on the subject and went hiking and foraging in the hills with my husband. When your kid has an interest in eating more plant food, you go with it, right? So, one day when I saw “mustard greens” on markdown at the grocery store for 99 cents, I decided to buy them so he could have the tasting experience. I had no idea what I was going to do with them. Turns out, it was amazing! Since then, this easy stuffed mushrooms recipe has become near and dear to our hearts — without or without the mustard greens or foraged plant foods from the surrounding San Diego hills. Seriously, I just buy my greens at Ralphs, people. We make this easy stuffed mushrooms recipe for every major event or holiday. Over the years, I’ve learned how wonderfully flexible it is. You can use spinach, kale, mustard greens, power greens, whatever. You can use parmesan, but finely shredded white cheddar is equally amazing. You can use homemade bread crumbs or panko from a box. Whatever floats your boat. Just make sure you’ve got the main components and play with it however you like. I’m thinking goat cheese would be nice melted into the filling or a pepper jack to take things in a spicier direction. The filling itself is divine, so feel free to make extra to serve on toast. So very good! Now, one trick I’d like to point out about stuffed mushrooms is this: you need to pull some of the water out of the mushrooms before you stuff them in order to get a tender, not-soggy mushroom. This is something that I’ve noticed missing from many stuffed mushroom recipes. 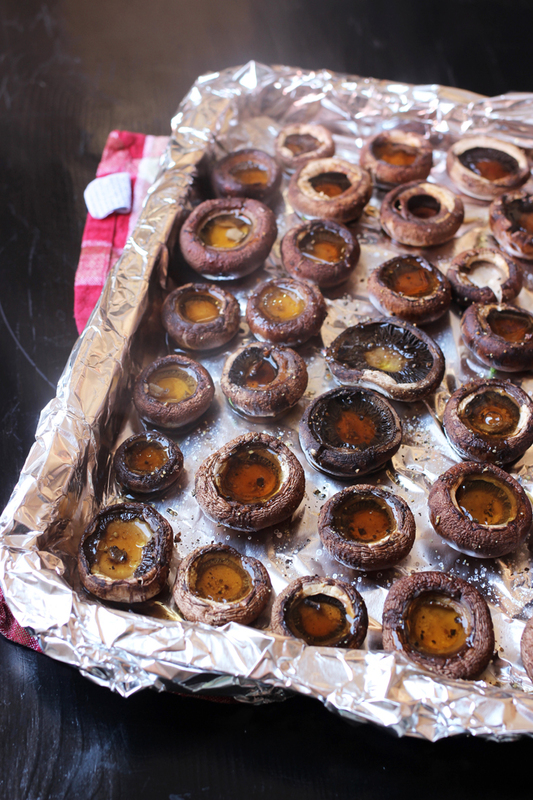 So, remove the stems (save them for the filling), lay the caps out on a foil lined tray, drizzle them with olive oil and season them with salt and pepper. A quick trip under the broiler will draw out some of the moisture from the mushroom caps. Drain off this liquid before you stuff the mushrooms. In this way, you won’t end up with half0raw stuffed mushrooms. 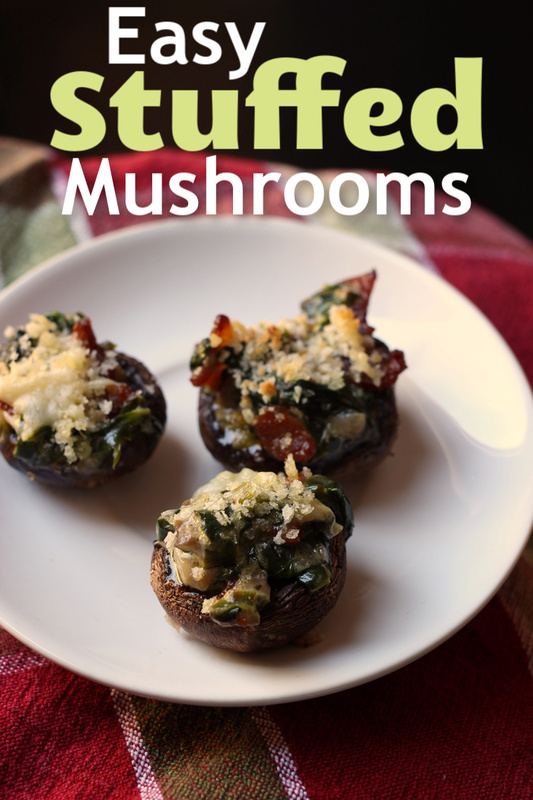 Instead you’ll have delectable, tender, mushrooms caps filled with an amazing, cheese-y, bacon-y filling that is to die for. Can you tell I love this recipe?! 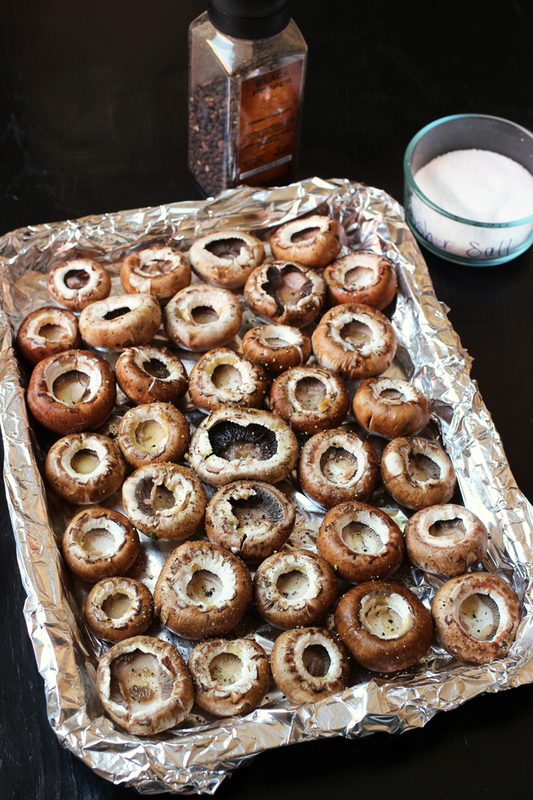 How can you make inexpensive AND easy stuffed mushrooms? Stock up on ingredients when they are on sale. When I find regular kitchen staples on sale, I buy a lot. I’m currently using a price book to track prices and that’s saving me money. For this recipe, keeping an eye on the prices of cheese, bacon, sherry, and cream can help keep the price down. 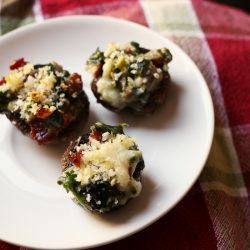 How do you make easy stuffed mushrooms? cooking tongs – These are great for moving the chicken pieces in the pan. Rinse and wipe the mushrooms clean. Remove the stems and chop them finely. Place the mushroom caps on the lined baking sheet. Drizzle the caps with olive oil and season them to taste with salt and pepper. Broil the caps for 5 minutes. In a large skillet, cook the bacon until crisp. Remove the bacon from the skillet and drain the bacon bits on paper toweling. Set them aside for now. 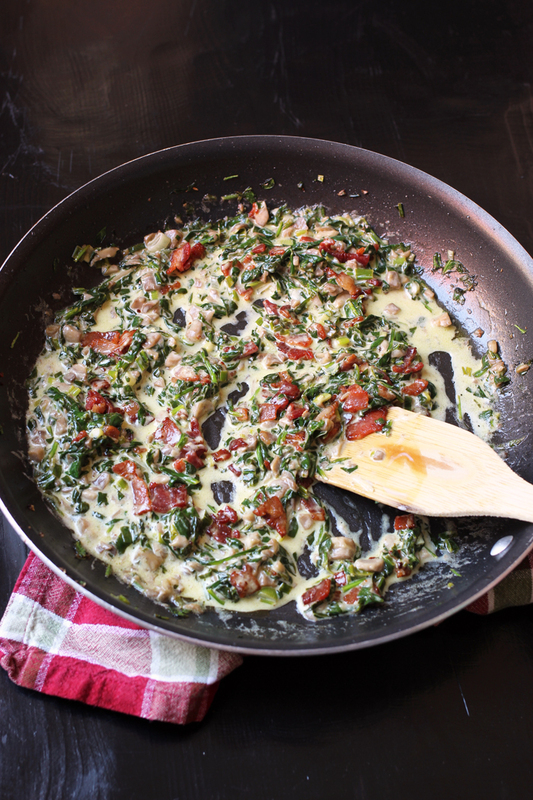 In the skillet of bacon drippings, cook the mustard greens, green onion, and chopped mushroom stems until the greens are wilted. Stir in the cooking sherry and allow to cook until almost evaporated. Add the cream and 5 1/3 tablespoons (1/3 cup) cheese. Cook for a minute or two more on low heat until the cream has started to thicken. Stir in the bacon. Drain off the accumulated juices from the mushroom caps. Fill the caps with the mustard greens mixture. Eat any leftover filling with sourdough toast. Remember to make extra filling next time. Place the filled caps on the baking sheet. Top the mushrooms with the bread crumbs and remaining cheese. Broil for 2 minutes until golden. Serve immediately. 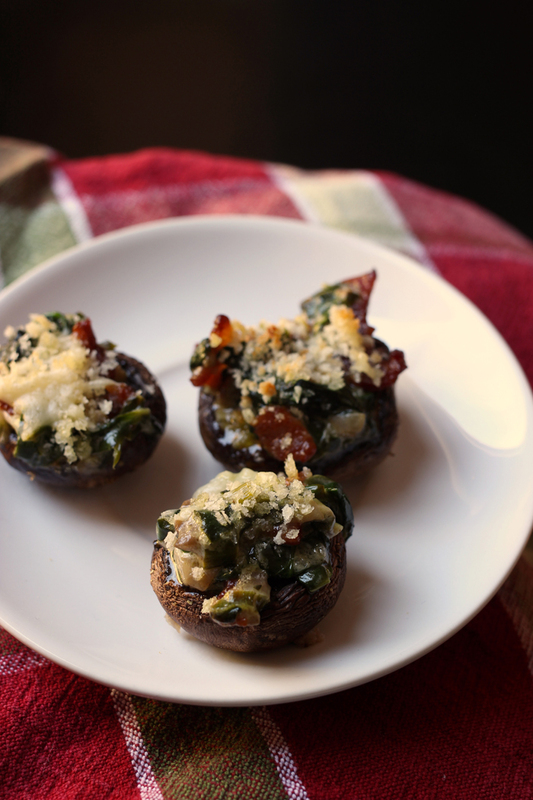 I don’t mind having greens on New Year’s — especially if they come stuffed in a mushroom! Do you have greens on New Year’s? So gald they turned out, they make a pretty pic too! can your son recommend some edible foraging books? I read Stalking the Wild asparagus, but haven’t been able to find any others that were very helpful. Also, does he eat lambsquarter, and if so, how does he prepare it? @Trish, he has checked out pretty much everything the San Diego library carries, but I’m not sure that he has a favorite. My publisher just sent him Wild Vegan which he has enjoyed. I have eaten lamb’s quarters also called wild spinach, as I recall. I just washed the leaves and fixed it like spinach cooking it in a little water. It is best when it is fairly young. I’ve been known to let the weeds grow in part of the garden to go to seed so I would have lots the next year, but found that can get out of hand! Years ago I had a book called Field guide to Edible Wild Plants, but I would suggest you check with your local state extension service. They may have information for your area or classes in identifying wild foods. I was introduced to lamb’s quarters years ago by older folks who picked and ate them.